Dr. Livermore is a third-year Radiology Resident and, at the time this article was written, Dr. Adusumilli was an Assistant Professor of Radiology, Division of Abdominal Imaging and the Associate Program Director of the Residency Training Program Department of Radiology, University of Michigan Health System, Ann Arbor, MI. † Dr. Adusumilli died March 3, 2007. 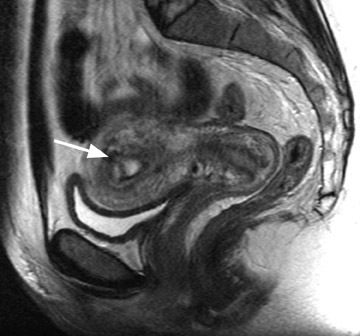 Magnetic resonance imaging (MRI) is ideally suited for the evaluation of uterine disease because of its multiplanar imaging capabilities, excellent tissue contrast, and lack of ionizing radiation. This article addresses issues related to benign uterine disease that are relevant to daily practice. 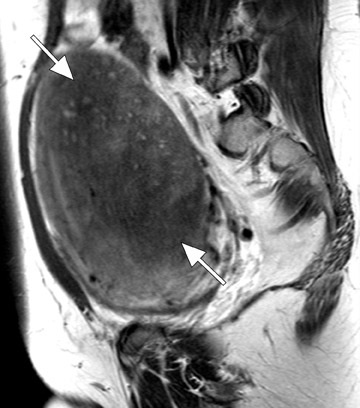 We have expanded the discussion beyond the description of typical MRI features of adenomyosis and leiomyomas by presenting diagnostic challenges related to these disease processes. Rarer entities (such as uterine arterio-venous malformations and retained products of conception) are introduced in this article because they have considerable impact on patient management. MRI is ideal for differentiating these 2 entities because of its excellent soft tissue contrast. 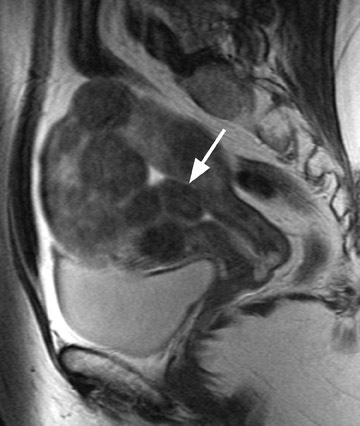 MRI has a high sensitivity (78% to 88%) and specificity (67% to 93%) for the diagnosis of adenomyosis because of its ability to delineate the zonal anatomy of the uterus. 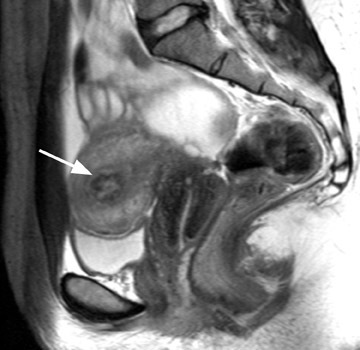 1,8,9 Hricak et al 10 described 3 distinct layers of the uterus that can be identified on T2-weighted (T2W) imaging. The JZ, which is the innermost layer of the myometrium, is of low signal intensity and is located between the endometrium (high signal intensity) and the outer myometrium (intermediate signal intensity) (Figure 1). 11 The JZ is normally <8 mm in maximal thickness. Uterine fibroids are composed of a combination of smooth muscle cells and fibrous connective tissue and can be found in approximately 20% to 30% of reproductive age females. 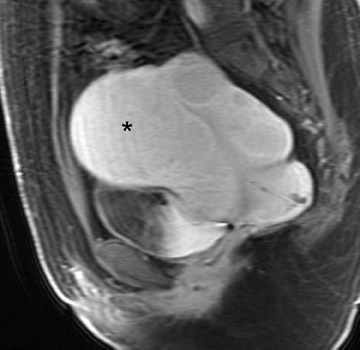 12 As these masses enlarge, they commonly outgrow their blood supply and undergo varying degrees of necrosis, which accounts for their variable signal intensities on MRI. Typically, leiomyomas are low in signal intensity relative to their surrounding myometrium on T2W imaging (Figure 4) and are isointense to myometrium on T1W imaging. 11,15 These signal characteristics are related to the most common form of degeneration (60%), which is hyalinization throughout the leiomyoma. 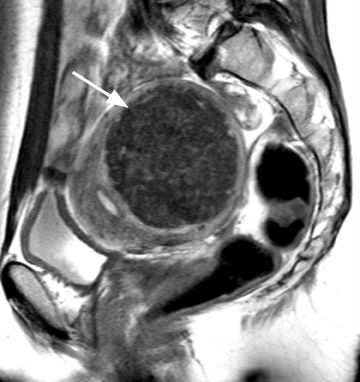 12,15 Weinreb et al 16 defined diagnostic criteria for a leiomyoma to include a uterine mass that is predominantly hypointense compared to myometrium on T2W imaging and predominantly hypointense on T1W imaging. 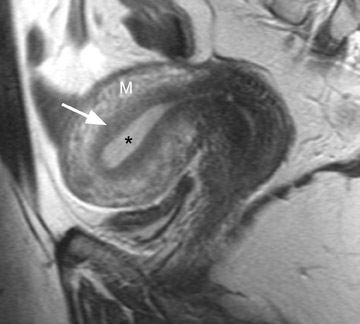 A well-described MRI feature that is helpful in the evaluation of large pelvic masses has been referred to as the "bridging vascular sign," which consists of vessels and/or signal voids that extend from the uterus to supply a pelvic mass. 17 The identification of the bridging vascular sign increases the diagnostic confidence that a large pelvic mass is a uterine leiomyoma. The bridging vessels can be identified as enhancing tubular structures on contrast-enhanced T1W imaging or as flow voids on a T2W fast spin-echo sequence (Figure 5). In a study by Kim et al, 17 the bridging vascular sign was present in 20 of 26 exophytic leiomyomas and was absent in all other adnexal masses, resulting in a diagnostic accuracy of 80%. 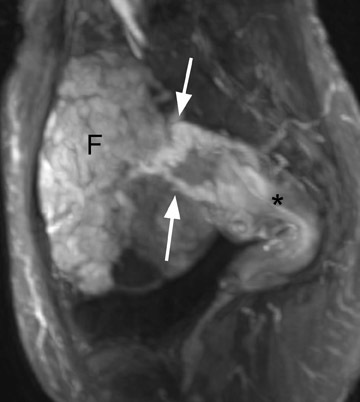 Another diagnostic dilemma encountered on MRI is the differentiation of a degenerating fibroid from malignant transformation of a fibroid into a leiomyosarcoma. 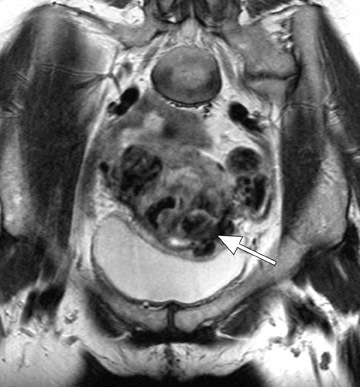 Sarcomatous transformation of a pre-existing leiomyoma is thought to be rare. It is believed that most leiomyosarcomas actually arise independently from the myometrial smooth muscle cells. The clinical significance of this differentiation is important, in light of the growing use of uterine-sparing leiomyoma treatment such as myomectomy, GnRH analog, and uterine artery embolization (UAE). 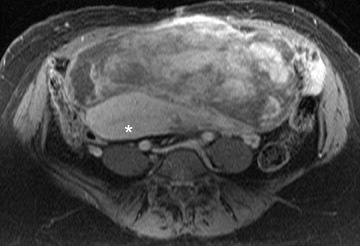 18 Clinically, malignancy can be suspected if there is a rapidly enlarging pelvic mass, if a mass does not involute after menopause, or if a mass does not decrease in size following GnRH therapy. Unfortunately, the diagnosis of sarcomatous degeneration is most commonly made as an incidental pathologic diagnosis in 0.5% of resected leiomyomas. 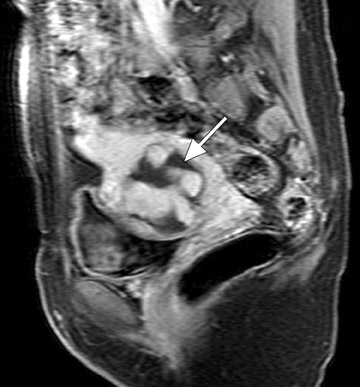 16,19 Suspicious imaging findings of malignant degeneration on pelvic MRI include ascites, lymph node enlargement, and peritoneal seeding. However, earlier detection is obviously desired. 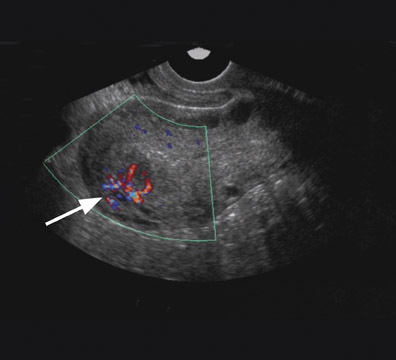 Uterine AVMs have nonspecific and often confusing imaging features on gray-scale sonography, including multiple tubular anechoic spaces within the myometrium. 30 Color Doppler is valuable and can show marked hypervascularity of the mass (Figure 9) as well as reversal of flow. 30,32 Spectral Doppler reveals low-resistance high-velocity arterial flow (resistive index of 0.25 to 0.55), and low pulsatility (pulsatility index 0.40 to 0.59). Sonography may detect a vascular abnormality in the myometrium and offer a potential diagnosis of AVM. However, arteriovenous shunting, in itself, is a nonspecific finding that can occur in other conditions such as pregnancies, missed abortions, trophoblastic disease, and ectopic pregnancies. MRI is able to confirm the diagnosis, better define the extent of the lesion, 30 and offer a more accurate characterization in the setting of equivocal sonographic findings. 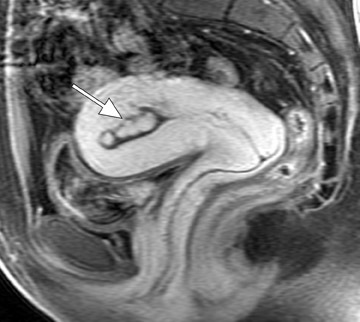 Typical MRI findings of an AVM include a focal uterine mass that consists of a group of distinct, serpiginous flow voids on T2W imaging with an ill-defined border that disrupts the JZ and is associated with prominent parametrial vessels (Figure 9). 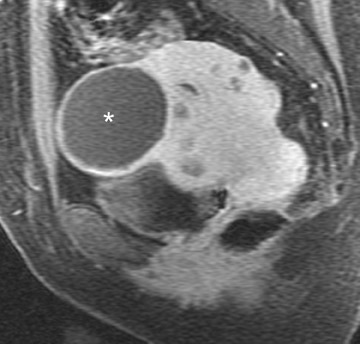 30,32 Dynamic contrast-enhanced T1W gradient-echo imaging will also reveal opacification of the vessels within the uterus and adjacent parametrium as well as depict an early draining vein. 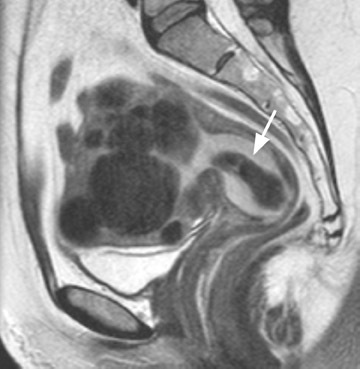 An AVM has a propensity to erode into the endometrial cavity if it reaches a large enough size (Figure 9). Stable patients without heavy bleeding can be treated conservatively and followed expectantly. 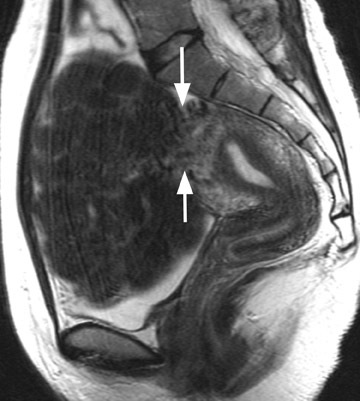 Another vascular-appearing uterine abnormality that is well-suited to MRI evaluation is retained products of conception (RPOC)-the retention of placental tissue within the uterine cavity after delivery or abortion. The placental fragment may eventually form a placental polyp that can be retained long after the initial pregnancy. Retained products of conception have been reported to complicate approximately 1% of all pregnancies 33 and commonly present with vaginal bleeding either late in the postpartum period or even months to years after the pregnancy. The diagnosis may be evident when considering the patient's clinical presentation and laboratory data (β-HCG). 32 Patients with postpartum hemorrhage are initially evaluated with ultrasound, which reveals echogenic material within the endometrial cavity. 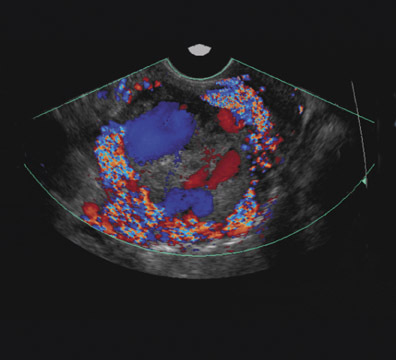 32 However, occasionally, RPOC may appear as an intramural mass (consisting of serpiginous vessels) that shows vascularity on color Doppler and thus mimics a uterine AVM (Figure 10). It is important to make the distinction between RPOC and AVM, as RPOC are routinely treated with dilation and curettage that could result in hemorrhage in the presence of a uterine AVM. 32 In cases of confusing sonographic findings, MRI is the ideal next step for identifying imaging features that would suggest an AVM and also for delineating the exact location of the lesion. 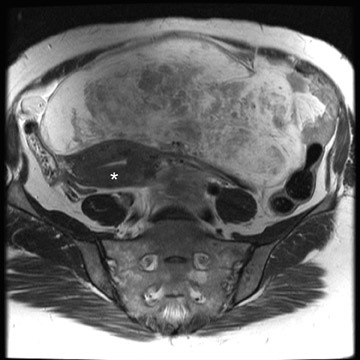 MRI is an invaluable problem-solving tool when evaluating women with benign uterine conditions. The use of T2W and gadolinium-enhanced T1W imaging is particularly important in accurately localizing and characterizing uterine masses. 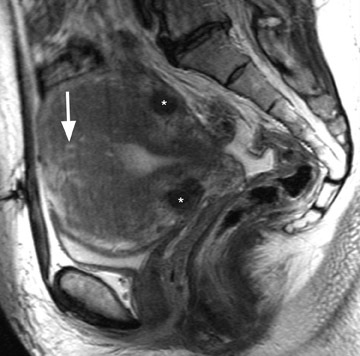 An awareness of important imaging principles related to specific uterine diseases, as discussed in this article, should help the practicing radiologist solve these radiologic dilemmas. Dr. Livermore and the editors of this journal would like to thank Hero K. Hussain, MD (Assistant Professor of Radiology, Director of Clinical MR Service, and Chief, Body MRI, Department of Radiology, University of Michigan Health Service, Ann Arbor, MI) for her assistance in reviewing this article following Dr. Adusumilli's death. 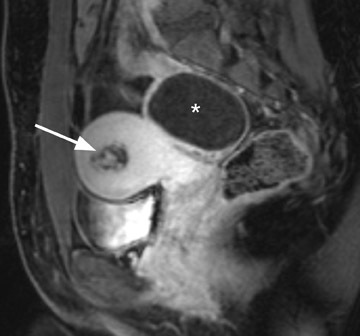 MRI of benign uterine conditions. Appl Radiol.